In February this year, Spud was asked if he would like to try out a card called Osper for children between the ages of 8-18 that would help him learn about finances and how to budget his pocket money. Once I'd checked over the website and felt that it was a safe enough for Spud to use I emailed back to accept the offer. 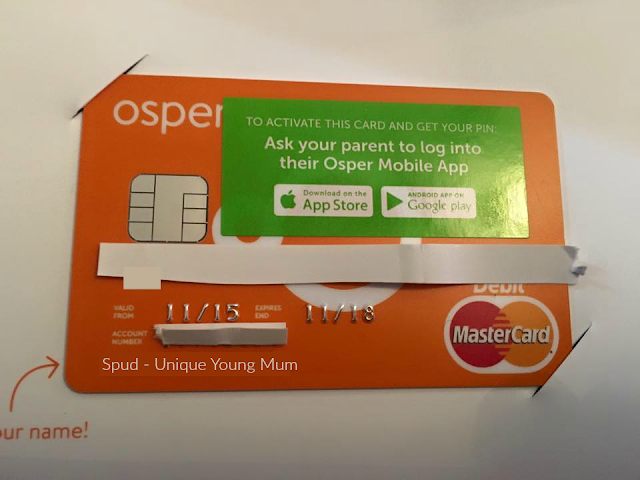 A few days later (back in February) a envelope addressed to Spud arrived through the door and inside was his brand new shiny, bright orange Osper card loaded with some money in return for our thoughts on the Osper service. Usually I like reviews to go up within two-four weeks of us receiving/trying out a product/service. However I wanted to do things differently with Osper as after all it is a service based around money, and I wanted to make sure I had everything covered before sharing things with my readers. So six months and a few weeks on, here is our honest review of the Osper card. Osper is a unique service (one of only a few around) that help parents trust their children with money via a very simple and easy to use app. The safe and easy to set-up app includes everything a parent needs to help their children spend money wisely whilst checking up on our childs/children's spending habits and the best thing about it all is it isn't a bank account, so doesn't require you to visit branches and the alike. 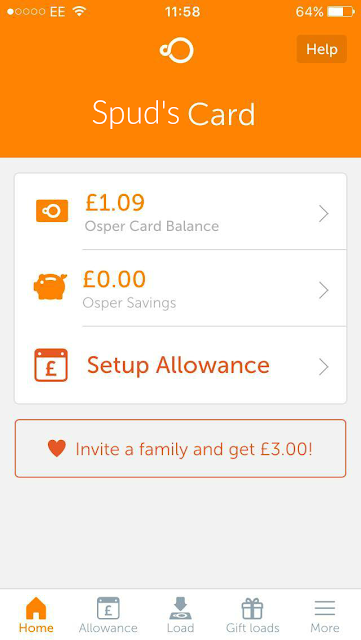 Once you've registered your child's card with the Osper app, the card is ready to be used instantly, of course it will help if there is money in your child's account to spend - again a very simple and easy task to complete. There is also a way for family and friends to pay funds into your childs account, so if the grandparents wanted to treat your child or your child's friend wants to pay some borrowed money back, there is a way to do it. Sometimes I give Spud extra pocket money for doing task around the house, or if he's had a super good week at school, so it's comforting to know that I can top up the card at any time I like via the app in a few minutes. If you give your child a certain allowance, then Osper can also help you control this too, without the need to withdraw cash and then let your child walk around with it! Of course if your child wanted cash then Osper allows them to withdraw cash from UK ATM machines for free of charge (to use ATM machines abroad it will cost £1 per transaction). Another great thing that I love about Osper is the fact that both myself and Spud can have a separate account, however its linked to Spud's one account. We both have unique logins and passwords, however we're able to control different things from each account. I can control how much and how often Spud's card should be topped up, with the funds instantly being transferred from my bank account into his Osper account and I can also do things like turning on and off the online spending function. Whereas Spud can only do things like set up a savings goal, check his balance and tag his purchases. I know many parents worry about what their children spend their money on, so I find comfort that Osper tells me where Spud has used his card (although I know this all at the moment anyway as he's always with me, I know it will come in handy for when he does start using his card alone) and then Spud can tag his spends on certain categories (like food, clothing, games etc) which helps me establish what he spends the majority of his money on. Another worry for parents is children remembering their pin numbers, however with the clever Osper app, the pin number is accessible at any time of the day or night by holding down on the pin screen for a few seconds until the pin number for your childs card is revealed. So what's the cost I can hear many of you thinking? Ordering a card and trying out the service for one month is FREE, however after the first month is up it will charge you either £1.50 or £3.00 per month depending on what plan you go with. There are two plans, with not that much of a big difference between them, however we did go with Osper Learn which cost £3 a month (billed annually). Osper is very different to children's bank accounts which is what I love. Prior to using Osper, Spud was given his pocket money in cash, and has lost money two times previously. Whilst I know fully well he can lose his card, I can block it instantly meaning no 'money' is lost. It will still be in his account and he won't be able to spend any of it until his new card arrives. A bonus for me as a parent is Osper NOT having the contactless system that so many cards have these days, if I lost my card, someone could easily spend up to £30 on it a number of times. Whilst I find it convenient sometimes, I'm a lot older and wiser than a child, and take due care to know where my card is at all times, children (or at least Spud) can get distracted easily, and we have to accept the fact that accidents can happen, and items can get lost. 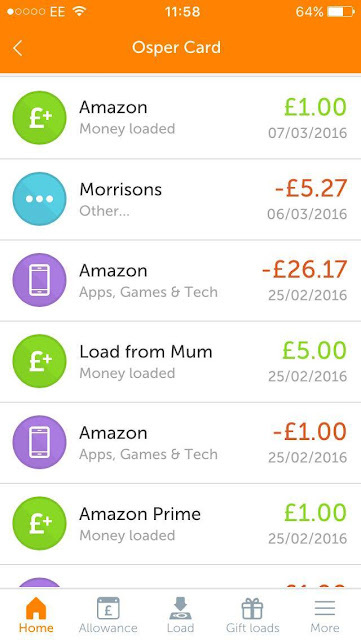 A bonus for Spud is being able to remember where he's spent his money with thanks to the app. We've been on holiday before and he couldn't remember pound for pound where his money had went, but now he (and myself) can track (and remember) exactly where he's spent his money. Spud also likes the independence he has with using the card and the app, he has told so many of his friends about it that they've asked if he can bring it into school, of course I said no, but it's nice to see that he thinks fondly of the service, which makes me feel like my money hasn't gone to waste. Whilst we love the app just like Davina McCall, I personally would love to see a online (non app) service become available. I use apps often, but I've also gone through quite a few phones and when you're given a loan phone from your phone insurers - they usually aren't smartphones, so the only way to access the web is via my laptop, and as Osper is only accessible via the app, I'd have problems accessing Spud's account if I was ever without my smartphone. Disclaimer: Spud received £50 on his Osper card in return for his thoughts on the service. This £50 was then spent on lots of games, and some sweet treats! I then paid for a years membership out of my own pocket as we personally like the service.